The A-10 Warthog was built around the GAU-8: a 600 pound seven-barrel cannon barfing out 30mm tank-slaying rounds so fast that 1,000 of them make a single sound, which became the plane’s signature song. Not quite as vicious as a Nerf gun, but awesome in a different way. 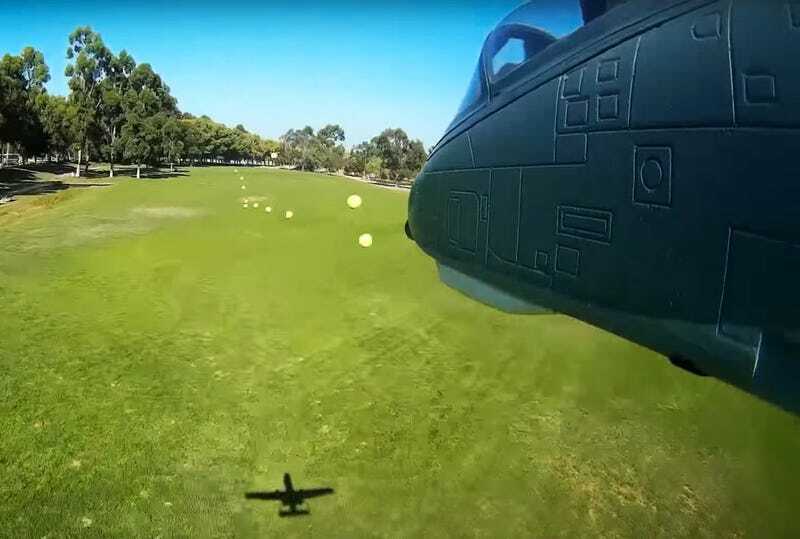 What you’re looking at here is a remote-controlled A-10, with a rapid-fire Nerf gun mounted inside and connected to a remote trigger. Man, I’d barely gotten over how badass a remote-control A-10 is even without the camera or cannon by the time the video was over. Here this dude is testing out various soft armaments for his tiny plane! More than anything, this video makes me want to buy a model A-10 of my own. I’m not too old for toys, right? It would be great to see this thing go through some challenges, like an aeronautical obstacle course with rings to fly through and targets to shoot. Maybe ajw61185's channel will yield some more miniature air strikes soon.